6 Health Benefits of Drinking Beer. You Heard Right. 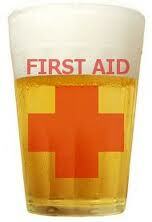 All alcohol, whether it is beer, wine, or liquor, is known to help reduce heart disease. According to a 2008 article in the Journal of the American Dietetic Association, moderate consumption of alcohol makes blood less sticky, and so it is less likely to clot. Alcohol can also increase good cholesterol and lower the bad, as well as lower your blood pressure. A Harvard study of 70,000 women found that those who consumed beer had a lower blood pressure than those who consumed wine or hard alcohol. Alcohol gets a bad wrap for being hard on your kidneys, but beer can actually help in that department. According to the 2011 ADA Times, beer can actually reduce your risk of kidney stones. The hops not only help slow the release of calcium from the bones — too much calcium can cause kidney stones — but beer also has a high water content, which helps clear out those kidneys.